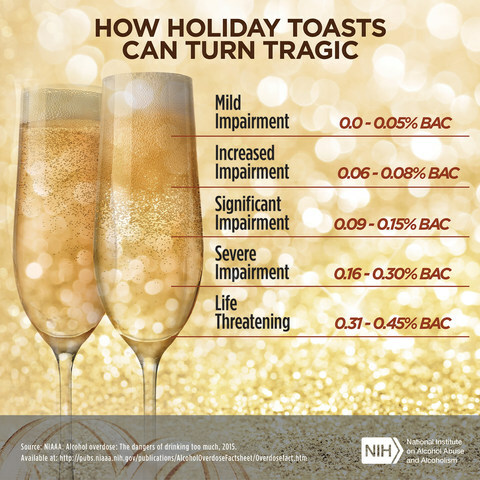 We all want to celebrate during the holidays, and more people are likely to drink beyond their limits during this season than at other times of the year, says the National Institute on Alcohol Abuse and Alcoholism (NIAAA). Some will suffer adverse consequences that range from fights to falls to traffic crashes. Sadly, we often put ourselves and others at risk because we don’t understand how alcohol affects us during an evening of celebratory drinking. Holiday revelers may not recognize that critical decision-making abilities and driving-related skills are already diminished long before a person shows physical signs of intoxication. Initially, alcohol acts as a stimulant, so people who drink may feel upbeat and excited. But don’t be fooled. Alcohol soon decreases inhibitions and judgment, and can lead to reckless decisions. As we consume more alcohol, reaction time suffers and behavior becomes poorly controlled and sometimes even aggressive—leading to fights and other types of violence. Continued drinking causes the slurred speech and loss of balance that we typically associate with being drunk. At higher levels, alcohol acts as a depressant, which causes the drinker to become sleepy and in some cases pass out. At these levels, alcohol can also cause blackouts—which are periods of amnesia when a person does not remember what happened while he or she was intoxicated. The intoxicated person actively engages in behaviors like walking and talking, but does not create memories for these or other events that occur during the blackout. At very high levels, drinkers face the danger of life-threatening alcohol poisoning due to the suppression of vital life functions. 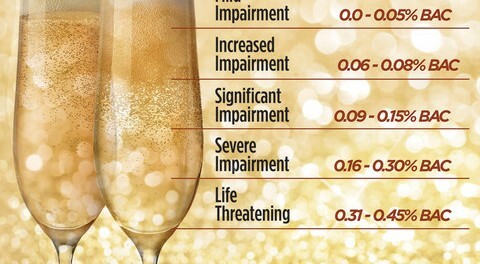 During an evening of drinking, it’s also easy to misjudge how long alcohol’s effects last. For example, many people believe that they will begin to sober up—and be able to drive safely—once they stop drinking and have a cup of coffee. The truth is that alcohol continues to affect the brain and body long after the last drink has been finished. Even after someone stops drinking, alcohol in the stomach and intestine continues to enter the bloodstream, impairing judgment and coordination for hours. Of course, we don’t intend to harm anyone when we celebrate during the holiday season. Yet violence and traffic fatalities persist, and myths about drinking live on—even though scientific studies have documented how alcohol affects the brain and body. Because individuals are so different, it is difficult to give specific advice about drinking. But certain facts are clear—there’s no way to speed up the brain’s recovery from alcohol and no way to make good decisions when you are drinking too much, too fast. So this holiday season, do not underestimate the effects of alcohol. Don’t believe you can beat them, or they may beat you. Pace yourself. Know what constitutes a standard drink and have no more than one per hour—and no more than 4 drinks for men or 3 for women per day. Have “drink spacers”—make every other drink a nonalcoholic one. Fact: The coordination needed for driving is compromised long before the signs of intoxication are visible and one’s reaction time is slowed. Plus, the sedative effects of alcohol increase the risk of nodding off or losing attention behind the wheel. Fact: Caffeine may help with drowsiness but not with the effects of alcohol on decision-making or coordination. The body needs time to metabolize (break down) alcohol and then to return to normal. Also, when caffeine wears off, there are the additive effects of the increased sedative effects of alcohol and post-caffeine sleepiness. There are no quick cures—only time will help. Fact: Alcohol widens the tiny blood vessels right under the skin, so they quickly fill with warm blood. This makes you feel warm or hot, and can cause your skin to flush and perspire. But your body temperature is actually dropping, because while alcohol is pulling warmth from your core to the skin surface, it is also depressing the area of your brain that controls temperature regulation. In cold environments, this can lead to hypothermia. So, wear a coat when it’s cold outside, particularly if you are drinking alcohol.